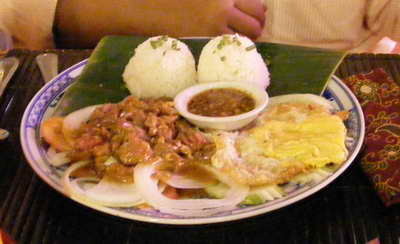 Rice and Fish are the main staple of the typical Cambodian diet though many dishes are prepared with beef, pork or chicken. Sea food is abundant in coastal areas with shrimps and crab among the favourites. Local specialties include Amok (fish-cooked in coconut milk) and a variety of soups, and curries similar in taste though not in spiciness to Thailand. Phnom Penh is truly cosmopolitan with Chinese, Japanese, Korean, Thai, Vietnamese, Malaysian, Nepalese, Indian, Turkish, Mexican, French, Western and other restaurants dotted around the capital. Trying Cambodian food is a must when you're in Cambodia! 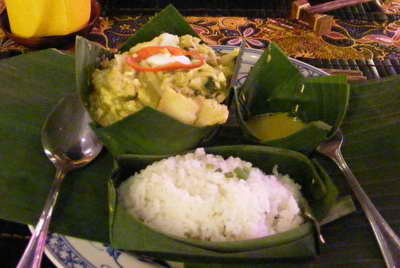 Luckily there are many restaurants in Siem Reap so you will have plenty of opportunities to do so. It is a curry of sorts, but with a much milder taste than Indian curry. 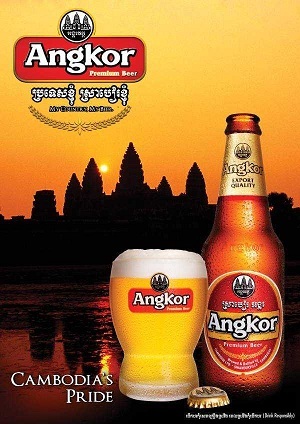 Because it's also coconut based, amok is probably more comparable to Thai curries, although more mild. Does that mean it's not good? Not so! Although the flavour does not scream for attention, it has that subtle taste that is comforting and relaxing. There are no surprises with amok, just a simple and good hearty dish. Wow, I feel like a food critique, but never mind that. In short, I think amok is a dish that is worth trying while you're in Cambodia. You can usually choose either fish or chicken, but amok also comes in beef, shrimp, or pork. If you want to try something different, try the amok 'degustation,' which is an amok dish made from a combination of these meats. 1. Place the garlic, onion, galangal, lemon grass, turmeric, paprika, fish sauce and sugar in a blender or food processor and process until well blended. 2. Add the coconut milk and process again until thoroughly mixed. 3. Transfer the coconut mixture to a medium saucepan and bring to simmering point, stirring. Continue to cook gently for about 10 minutes until thickened. 4. Meanwhile, if using cabbage greens, place them in a large saucepan, cover with boiling water and set aside to soften. If using banana leaves, cut into pieces about 20cm/8-inches square. 5. Place the fish in a bowl, season with a little salt then pour over half the hot coconut sauce and mix well. Set the remaining sauce aside. 6. Place 1/8th of the fish mixture in the centre of each leaf and fold the edges over to form secure parcels, making sure you tuck the edges under. 7. Steam the parcels for 1 hour. 8. 5 minutes before the end of the cooking time, gently reheat the remaining sauce. 9. To serve - make a small opening down the centre of each parcel and spoon the remaining coconut sauce into the opening. Serve immediately with rice.